Consider Mount St. Mary's Cemetery as a final resting place for yourself or someone close to you. Located on Saint Mary's Mountain and near the National Shrine Grotto of Our Lady of Lourdes, the Mount St. Mary's Cemetery offers columbariums for cremation remains. ​The Columbariums are constructed of gray stone and marble with black marble shutters. We currently have double niches, which hold two urns, available in the Seton Columbarium. The cost includes opening and closing but does not include engraving of the niche cover. 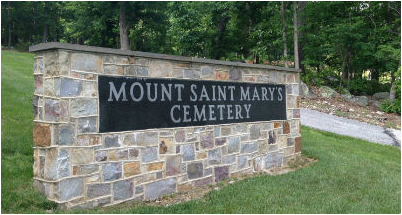 ​Mount St. Mary's Cemetery or National Shrine Grotto of Our Lady of Lourdes does not offer funeral services. ​We ask owners and visitors observe the Mount St. Mary's Cemetery Policies so to maintain the dignity and the beauty of our cemetery. *filling out a purchase agreement form guarantees the purchase of a niche. The exact niche requested will be confirmed with a staff member after the form is filled out. Take time now to discuss these matters and learn what you and your loved ones want. Be sure to put any wishes or requests in writing. This is also a good time to discuss donating to your favorite charity such as the National Shrine Grotto of Our Lady of Lourdes. Planning a final resting place for you and your loved creates many questions. Read our FAQ to learn the answers of some of the most common questions we receive. For more information call (301) 447-5318 or complete the following form. It is always difficult laying a loved one to rest. We hope to assist you in the best way possible in order to have a respectful and solemn interment or burial for your loved one. Please fill out this online form in order for us to best serve your needs. We will be praying for you in this most difficult time. Review availability of Mount St. Mary's Cemetery plots and niches; however, please contact us directly to receive the latest, updated version of the map. *We no longer have full burial or cremation plots available.